Thanksgiving and Christmas will be here before we know it. For many people, the season of gratitude is a great reminder to give back to those in need—whether it be by donating to a food drive, volunteering at a soup kitchen or giving money to a favorite charity. For parents like us, this season offers the perfect opportunity to teach kids about the importance of giving back to one’s community. And there’s no better way to do it than as a family! Here are a few family-driven ways to embrace this “teachable moment” and set a great example by instilling the spirit of giving in kids. After all, kindness counts! · Food Drives: Have kids go through cupboards with you to identify canned goods and boxed items that your family can donate to your local food drive. Ask older kids to check expiration dates to ensure freshness, and give younger kids the job of sorting or placing items in boxes. Or take a trip to the grocery store together and let kids help pick out items to buy and donate. By loading items onto the grocery belt and helping to bag and deliver goods, they’ll feel like an important part of the process. · Clothing Donations: Donating clothing is a win-win. You get to eliminate clutter and help those in need at the same time. Plus, you’re keeping items out of landfills by giving them a second life! Have kids play “fit model” by trying on clothing and seeing what no longer fits. They can also help sort, fold and bag clothing, and/or accompany you to the drop-off site. · Toy Drives: Many organizations, such as Toys for Tots, collect new, unwrapped toys for children in need during the holiday season. To get your kids involved, take them to the toy store and have them pick out a gift that they think a little boy or girl their age might like. They’ll love getting to weigh in with a kid’s perspective. · Visit VolunteerMatch to locate volunteer opportunities in your area. You can filter your search by “kids” to find age-appropriate activities that all family members can participate in—from park cleanups to animal rescue efforts and more. · Check with your school, place of worship or community groups to see if they need any assistance with charitable programs. Is the PTA collecting toiletries for a local women’s shelter? Volunteer your family to design, print and distribute flyers to get the word out. Is your child’s scout troop visiting a nursing home for holiday caroling? Dress your spouse and kids in cute matching sweaters and attend as a family to belt out holiday tunes. · Don’t wait for a formally organized effort to spread kindness or lend a hand. Pay a family visit to an elderly neighbor who may be lonely, or buy a bunch of craft supplies and sit down together to make holiday cards for the troops. Welcome the new family in town by shopping for and assembling a basket of goodies. 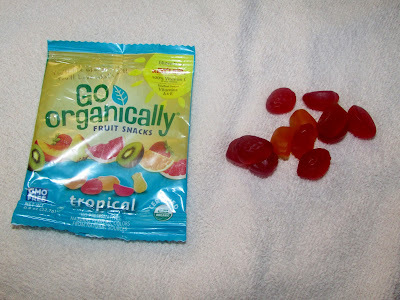 Bonus points if you include Go Organically Organic Fruit Snacks. 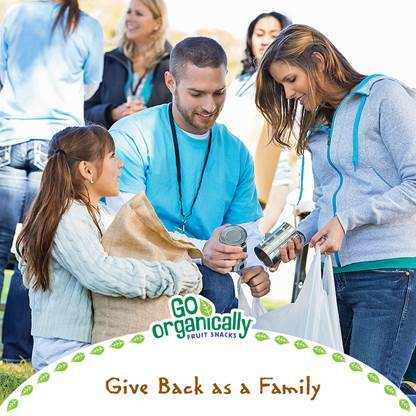 Happy helping from all of Go Organically! Made with real fruit, their gluten-free, nut-free, dairy-free kids snacks are a great choice for your on-the-go life. I help weekly with our church's backpack ministries to help the hungry children in the area. I donate to the local food pantry. I have babysitted for my daughter's best friend since he was born and he turned 1 about a month ago. I keep him everyday for her to finish high school plus she has a little job. I've never charged her and i buy diapers, wipes, clothes, whatever he needs. Some people say I'm crazy but i would do it again and again! Leave a comment on this blog post with a way that you help others or an act of kindness that you often do. We donate to charity and also help an elderly neighbor. We work at the Christian Help Center! Today my son and I picked up a mitten from the giving tree at his school and are buying gifts for the child we picked. I run errands for and check in on my elderly neighbors. We donate food and clothing all year long and donate gifts at Christmas time. I also donate either money to worthy organizations or food and clothing and eyeglasses for our local families in need. I always donate to our local food bank and I have a business that has left over items that I take to our local thrift shops, one supports the animal shelter and the other supports seniors in our community. We donate to different organizations once every few months. I get lots of free magazines, products and meals and share them with the women who clean and cook for my dad. I share my home grown veggies with friends and neighbors. Sorry! Made an error and didn't list the right answer in enter another giveaway!! Please correct to One Christmas Bear book. I always try to smile and be friendly. Sometimes a simple little thing like this can put a smile and warm feeling in someone else’s heart, and make their day a little better. They might then do the same for others. I donate clothing and household goods and provide pet food for the local humane society. We donate to the local dog shelter. One thing we love to do is use our savvy knowledge of coupons to shop for others. We buy extras of deals and either donate in large quantities to the food shelf or package bags for families we adopt at the holidays. We work as a team (my boys and I) and it doesn't cost us much but our time. We donate toys and food to homeless shelters. I donate food and clothing. We enjoy making up operation christmas child boxes at this time of year. I like to donate books to my local library. I bake and cook for people when I can. We donate our clothes to our local thrift store. I watched 3 of my nephews during the Thanksgiving break, while their brother was taken to a seizure clinic in Ohio. My kids always volunteer at the clean-up events around our city plus, donate throughout the year. Little things are giving coupons out if I have any in excess or if I see someone with an item I have a coupon for. I am always donating food to our local food bank as well as clothes and toys that we no longer need. I have been sending notes of encouragement to my daughter and her friends at college to keep their spirits up throughout the year. I donate to our local library to help them raise money from book sales. When the opportunity arises, we will buy homeless a meal. I like to pay for the person behind me in line at the drive thru sometimes. I have been donating weekly to a hurricane relief fund. I share what we can with other's a lot. I try to help anyone who needs it. My mother in law is currently recovering from a fall and subsequent surgeries. I'm helping her and my father in law by baking goodies for them and picking up grocery items for them. I like to donate clothing to local shelters and give monetarily to causes that help the less fortunate around the world. We feed a local group home holiday meals. We lend a hand up in a variety of ways to those that need some "positive" in their lives. We donate to a local shelter. One way I help others is to cook for them as much as I can. Several people in my life seem to really enjoy having meals prepared for them to make their life easier. I donate to a food pantry at a local church. Thanks for the giveaway. to donate books to my local library. i like to donate greeting cards to the local prisons for the inmates to send to their friends and families. We donate gently used items to charity. My family makes care packages for residents in our local nursing home. I have done a charity bike ride the last two summers each July! Every season when I switch out my clothes I donate what I don't think I will wear that season. Also when I have a few extra quarters i put them in the cart slots at Aldis and always leave my quarter behind. We volunteer our time and resources with our church and community when we can. I spend my time with my kids. I don't have much time to do much else. We donate our clothing, toys, and books to the local church as often as possible. no19034770 @yahoo.com I pay it forward and randomly pay for peoples groceries in line.. I donate to animal shelters often. I volunteer at my church in the kitchen and help donate food to low income families. It does my heart good and is a blessing. I give to local food banks. I volunteer with an organization that brings abandoned animal from hurricane areas. They also do other things for people in need. I volunteer where ever they need me! We donate food and other supplies throughout the year to our local shelter! Simple things like donating and helping out locally goes a long way from what I've seen. I volunteer for various organizations. My act of kindness is to always bring everyone into the conversation and to make them feel their comments are important.